Due to high demand, this item is Temporarily Out of Stock until March 15, 2019. You may pre-order to have incoming stock allocated to your order! Everyone loves to curl up with a favorite book on a snowy winter's day. And these elegant snowflake bookmark favors make each relaxing reading session a memory filled experience. Measuring 5.25" long (including the tassel) by 2" wide, each Let It Snow bookmark features a delightfully detailed silver metal snowflake page marker with an attached white tassel that peaks out of the book. 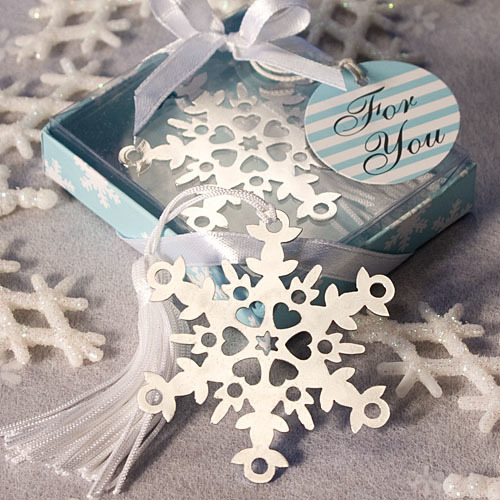 Each snowflake bookmark favor comes attractively packaged in a Let It Snow Collection signature box with a winter blue/snowflake design base and clear top, tied with a white satin bow and an attached round ice blue and white striped "For You" tag. Perfect as Winter Wedding Favors, Winter Wonderland Birthday Party Favors, Winter Baby Shower Favors and so much more!